The president spoke -- and joked -- at the 32nd Congressional Hispanic Caucus Gala. There was plenty to celebrate at the 32nd Congressional Hispanic Caucus Gala. More than 2,000 celebrants filled the Walter E. Washington Convention Center to kick off Hispanic Heritage Month. Never before has there been a Hispanic Justice of the Supreme Court, or as many Latinos serving in a presidential administration as there are currently, making Wednesday night's event all the sweeter. 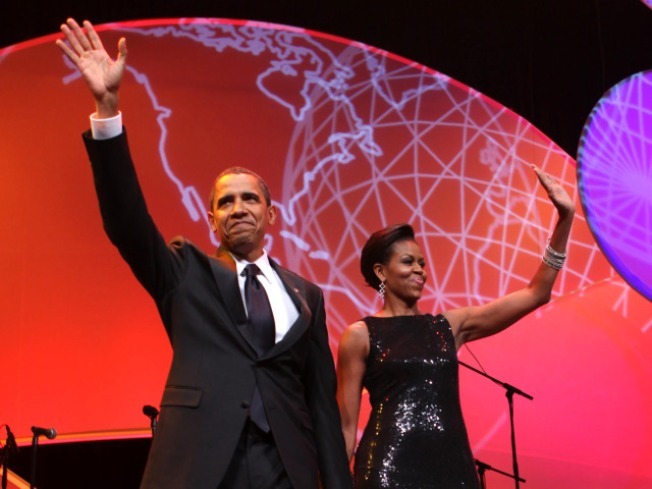 President Barack Obama, accompanied by First Lady Michelle Obama, joined in the celebration. "Todos somos Americanos" -- "we are all Americans," Obama said about the issues facing Hispanics. Supreme Court Justice Sonia Sotomayor was commended throughout the night by several speakers, including honoree Soledad O'Brien of CNN. Salsa singer Marc Anthony, with wife Jennifer Lopez by his side, received the CHCI Lifetime Achievement Award. He was a hit among the women at the gala. Both Speaker of the House Nancy Pelosi and Rep. Nydia Velazquez (D-N.Y.), CHCI chair, gushed that the singer was celebrating his birthday with them. Even Obama joined in, saying Velazquez had a crush on Marc. "I tell you, J. Lo's not going to like that," the president teased. Also in attendance were several prominent Hispanic leaders, including Secretary of Labor Hilda Solis and Secretary of the Interior Ken Salazar.